In the year 2013 we commemorated the 100th birthday of Dutch ceramist, modeler, and Delft painter Cornelis Verwoerd. What better way to mark the occasion than by sharing an extraordinary find. Please note that the small pictures are enlarged by hovering your mouse over them. On your touch screen tap a small picture to view it in the main window. Tap the enlarged picture to go back. The 1952 pendant by the Verwoerd Ceramics Studio (1949-1976) that is shown here, is not new to us. It is well documented in our VCO publications. It is amongst others mentioned and illustrated here. It is also correct to say that only samples have been made, certainly not more than 50, probably less. Some samples have been presented to prospective clients, and perhaps to friends and relatives. For all practical purposes they have disappeared. However, in our continuing research we made a remarkable discovery. A box containing 30, brand new, untouched, vintage 1952 Verwoerd pendants. 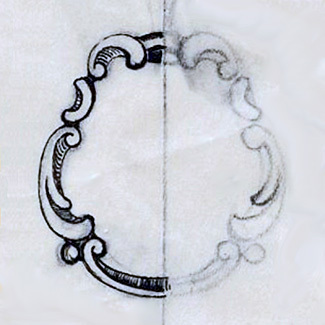 Producers of Delft cabochons would usually design and produce their new models at the request of a client. This would normally be a silversmith who would mount the Delft stones, and sell the finished product through his own channels. Samples would be made on the request of the client, and in the numbers requested. 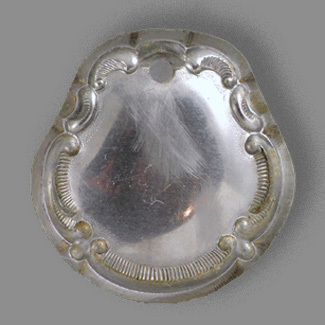 In this case however, the pendant was designed, hand painted, and marked with a period 3 Stones Delfts signature by Cornelis Verwoerd on his own initiative. This probably explains a slightly larger number of samples. They might come in handy if Verwoerd was going to present them to a number of different clients. Our find is a silent witness of the fact that the project never reached the regular production phase, in spite of the beautiful classic design and the great craftsmanship involved. 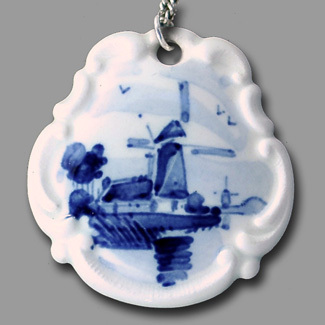 This pendant is known as a "Porcelain Painting Pendant" or a "Plaque Pendant" after the wall hanging porcelain paintings or plaques that were produced by Delft potters in Holland from 1660 onward. Many of these plaques had a raised edge not unlike our miniature version. Please note that "porcelain paintings" were not porcelain at all. In fact Delft started out as a successful pottery imitation of Chinese and Japanese porcelain. 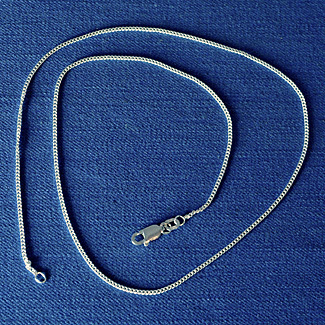 Verwoerd personally designed the pendant, and made a plaster model after which he ordered a steel die with the exact negative shape of the medallion. 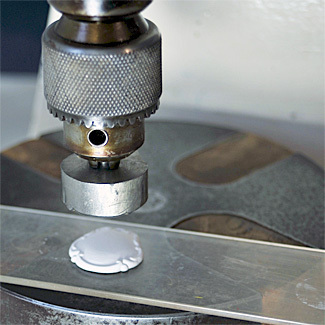 The steel die is used for pressing clay medallions, not unlike coining. After being fired in a pottery kiln at a temperature of 1060°C, the now bisque medallions are covered with a white engobe, i.e. a thin, white baking slip layer that is used to mask the inherent touch of yellowness of the pottery clay. The intended scenery is then painted on top of the engobe, traditionally using cobalt based blue pottery paint, and a variety of tiny brushes. The paint starts out as a dull black or blueish-grey, but turns during the firing process into a rich blue. Next the pendants are covered on both sides with a transparent glossy glaze, placed on miniature kiln spurs, and fired once more at 1060°C. After grinding off eventual spur marks, and attaching the 925/1000 silver necklace, the pendants are ready to be sold. Because the decoration is finally covered by the glaze, the Delft scenery is completely durable. 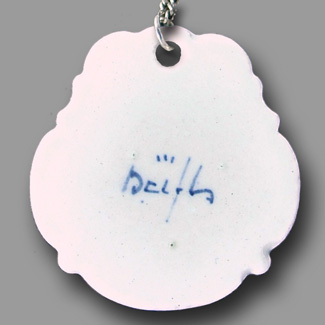 The fact that the pendant is glazed on both sides, prevents soiling of its reverse and enhances the delicate "porcelain" character of the piece. 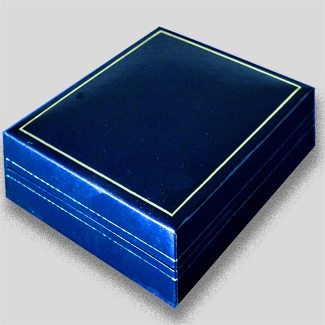 This is underlined by a slim design that has been made possible by moulding partially dried pottery clay with the specially designed steel die. It goes without saying that a delicate piece like this should be treated with appropriate care, and should never be dropped or otherwise handled roughly. Some of the samples will have been handed out to prospective clients or have served as a promotional gift, but 30 pendants sat in a box for 60 years waiting to be found. Maybe the young company underestimated the importance of marketing, as this was normally left to the silversmith client. Perhaps this is the penalty for going it alone. Or perhaps the ambitious project was simply crowded out by the regular demand for basic Delft stones that at the time already reached an average of 1,500 pieces per week. As a result the Verwoerd Porcelain Painting Pendant is extremely rare, and the present discovery can be considered an outright treasure. We feel that this rich find should be available to the general public as well. 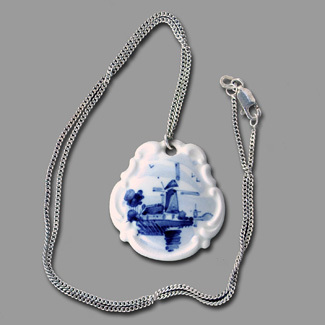 We have therefore decided to add five samples to our museum collection, and reserve the remaining 25 pendants for serious collectors of Delft pottery and Delft jewelry. As every pendant is hand painted by Cornelis Verwoerd personally, each windmill landscape or signature is slightly different. 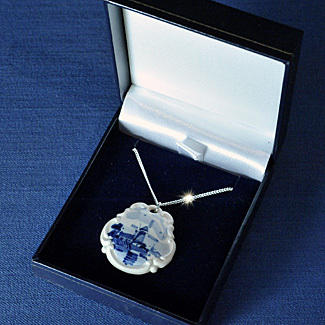 This true work of Delft craftsmanship - a prime example of the combined skills of Verwoerd as a designer, modeler, and Delft painter - comes with its 18" sterling silver necklace and a matching presentation box as illustrated in the final set of pictures. With only 25 pendants available worldwide, this is and will remain a very rare collectors item indeed. The price for one pendant is currently fixed at US$ 105 plus shipping. For the first 25 customers there will be only one item available each. Standard international shipping is US$ 10. Clicking the button below will take you to PayPal. The offer will expire automatically when all 25 pendants have been sold, but VCO reserves the right to postpone the offer sooner or change the price for new orders without prior notification. Please note that friends of Verwoerd Ceramics Online on Facebook may apply for a discount and free shipping. Please contact us through facebook or send your application to helpdesk at verwoerdceramics dot com. The proceeds of the Cornelis Verwoerd 100th Anniversary Offer will be used to carry on our research and broaden our knowledge base, with a view to making secure that we can continue our successful online publications, and provide valuable information to all lovers and collectors of Delft jewelry.